Enter for your chance to have your best original song recorded by Mark Schultz! This year, we are continuing our CREATE initiative with our most exciting songwriting competition to date. 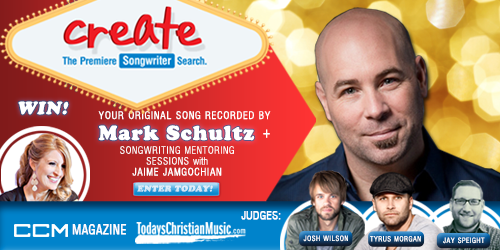 As one of the premiere songwriters in Christian music, we’re excited to announce that Mark Schultz has partnered with CCM Magazine and TodaysChristianMusic.com to offer the Grand Prize winner a special recording of their original song! For info, Rules, and more, please go to CreateSongwriter.com and select the CCM/Mark Schultz button. > CLICK HERE to enter TODAY! Various entry levels available! In addition to entering your song in our competition to see how you stack up against the best songwriters around the country, you can enter your song to be critiqued by one of our all-star judges: Sparrow Records artist Josh Wilson, songwriter and worship leader Jaime Jamgochian, songwriter for GRAMMY and Dove Award nominated artists (NewSong, Nicol Sponberg) / artist Tyrus Morgan, and songwriter (Travis Tritt, Trace Adkins, NewSong) / producer Jay Speight. You can also enter your song to be posted here on CCMMagazine.com and our contest site at www.CreateSongwriter.com – you can even enter your song into our Online Showcase level and have your song available as a free download and promoted through our sites and email lists for one year!